I don't exactly know who Baldwin plays in the forthcoming CG film (he provides the forward for the book), but I'm sure he's painfully witty. In any event, the flick sounds like it might be a very cool ride through the myths and legends of childhood. There's probably plenty in it to fill up this 150+ page art book from Insight Editions too. In Rise of the Guardians, North, Bunny, Tooth, and Sandy recruit the mysterious Jack Frost to help them stop Pitch from putting an end to childhood belief and sending the world into eternal darkness. Based on the children's book series by William Joyce, Rise of the Guardians is both an exciting adventure and a poignant exploration of the hopes and dreams of youth. Rise of the Guardians is one of DreamWorks Animation's most ambitious films to date. Its mythic premise allowed the artists at the studio to let their imaginations loose, producing a truly unique take on the imaginary figures of childhood, the worlds they inhabit, and the innocence and joy they represent. With more than four hundred pieces of meticulously reproduced art, including storyboards, character designs, visual development art, and effects concepts, The Art of Rise of the Guardians is an insider's tour of DreamWorks Animation's dynamic development process. Included is exclusive commentary from the director, producers, production designer, and crew that paints a fascinating picture of the way these filmmakers collaborated to create a stunning CG movie. Ramin Zahed is the editor-in-chief of Animation Magazine and the author of The Art of Puss In Boots. A journalist who has covered the film and television industries for over twenty years, he has written for PBS, the Hollywood Reporter, Los Angeles Times, Variety, and Movieline. He lives in Los Angeles. Alec Baldwin is a veteran actor with over forty film credits who stars in the award-winning television show 30 Rock. He lives in New York City. A true luminary and creative spirit, William Joyce, who has written and illustrated over fifty children's books, has put his personal stamp on children's media in every direction. He lives in Shreveport, LA, and is the founder of Moonbot Studios. 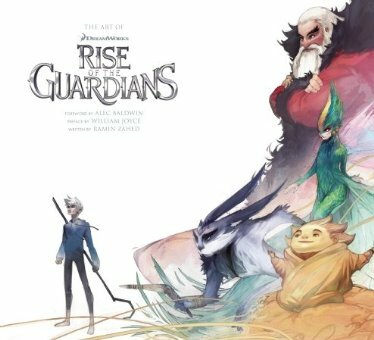 Look for The Art of Rise of the Guardians to make you a believer when it hits bookshelves next month.